Paul from Green’s Leaves gave us a lively insight into the plants his nursery grows. Paul’s philosophy is that a plant needs to earn its place in a garden by any of four main criteria: coloured foliage, scented, southern hemisphere or sheer weirdness! He then proceeded to illustrate his talk using plants that he had brought with him and giving many tips on the best way to grow them. judicious pruning helps limit size and in some encourages repeat flowering. With early season flowerers prune by 1/3 to improve shape. Planting in a ratio of one dark to two light gives a good contrast. Hollies – 1 male needed to 20 females to produce berries. Examples included ‘Sliver Hedgehog’ and the Chestnut Leaf Holly. Sorbaria – this plant suckers so plant in a large pot buried in the ground. Lovely early foliage, flowers, and autumn colour. Eupatorium ‘Mask’ – great for butterflies. Needs sun or part shade and a moist soil. 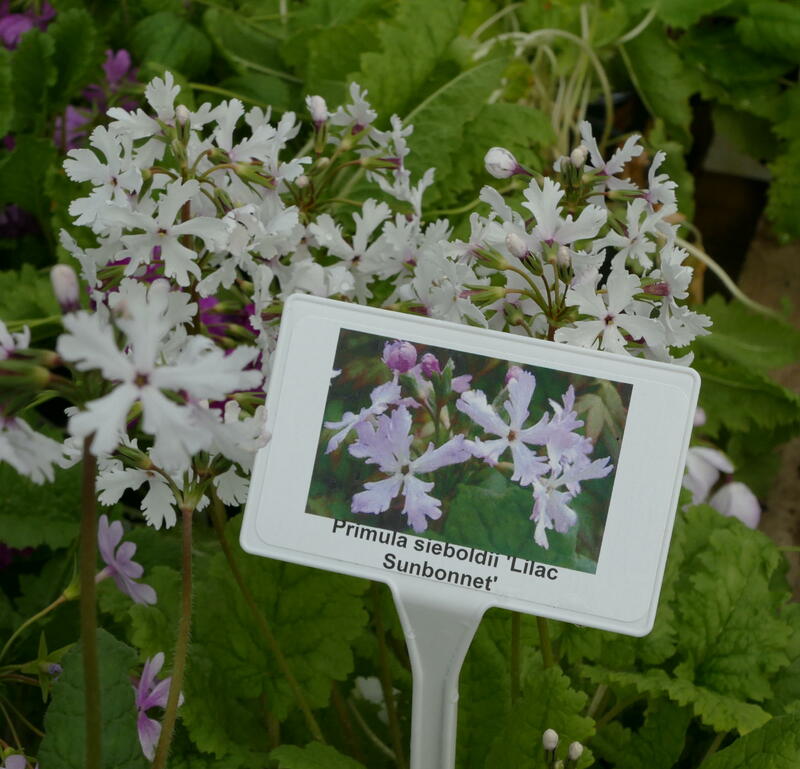 Gillenia trifoliata – white flowers in June and very good autumn colour. Buffalo Currant – yellow flowers, smells of cloves and great for bees. Plant in sun. Sarcococca ‘Winter Gem’ – an alternative to box. All in all a highly entertaining, informative talk. The topical tips for April were from Anne and Julian. Anne showed us her bulb planting trowel which is much narrower and more pointed than a conventional one. She says it is the only sort she now uses and not just for bulb planting but weeding and many other things too. When buying one remember to check the weld as this can be a weak point. Julian’s tips: firstly, our preferred method now for weed control on our quite extensive paths and yard. Having previously tried Pathclear, steaming, hot air (from an electric paint stripper – not Julian’s mouth) and a flame thrower. We use an 8 litre watering can with a fine rose, 750 grams of table salt and a small amount of liquid washing machine detergent (say half a cap full). Dissolve with stirring and using water as hot as you have, and then water the paths. Ideally do this at the beginning of a dry spell. It needs repeating maybe 6 or 7 times a year, and occasionally you may need to do a little hand weeding as well, but it’s better than anything else we’ve ever used, with surprisingly little collateral damage. We usually begin as soon as the first seedling leaves appear, in very early spring or late winter, and repeat as necessary. One watering can full will treat between 10 and 12 sq yds. Of course this being the UK he couldn’t possibly advise that any of you do this. We’re just telling you what we do! and the others are called “Oryx”. 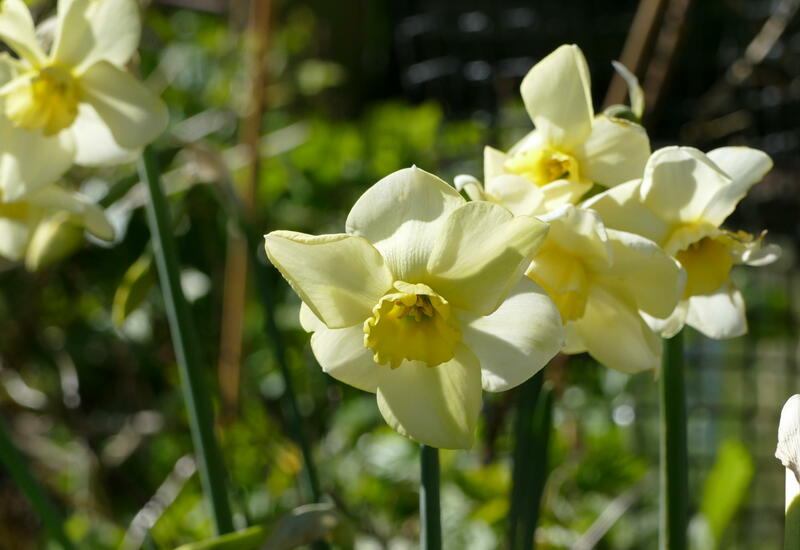 All Scamp’s daffs are grown in Cornwall and most seem to cope very well in our conditions. 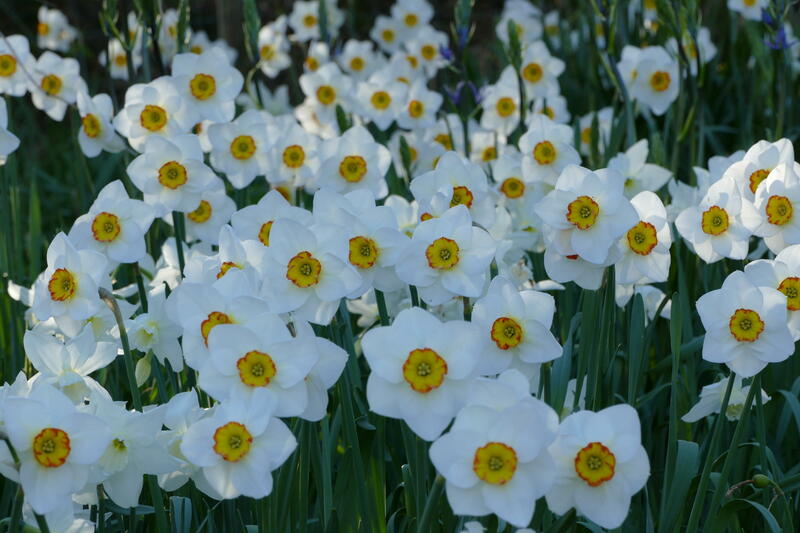 Most people order daffs in the autumn, but some of his good varieties sell out even by now, so have a look soon if you’re interested. 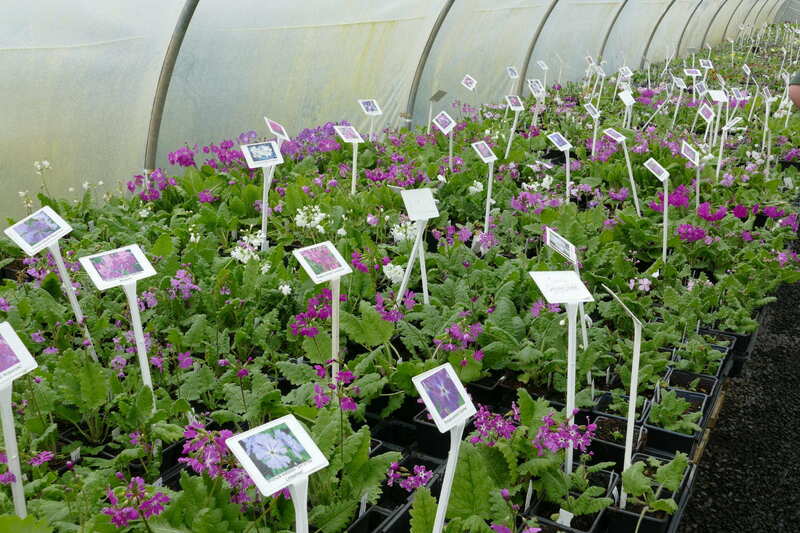 Richard Bramley, who most of us know, has recently built up an amazing collection, in flower now in one of his polytunnels at Farmyard Nurseries Llandysul, of Primula sieboldii. I’d urge anyone who likes the look of them to go and visit Farmyard whilst they’re still in flower. Our meeting on May 17th promises a restful departure from the busy time that most gardeners are having this month. 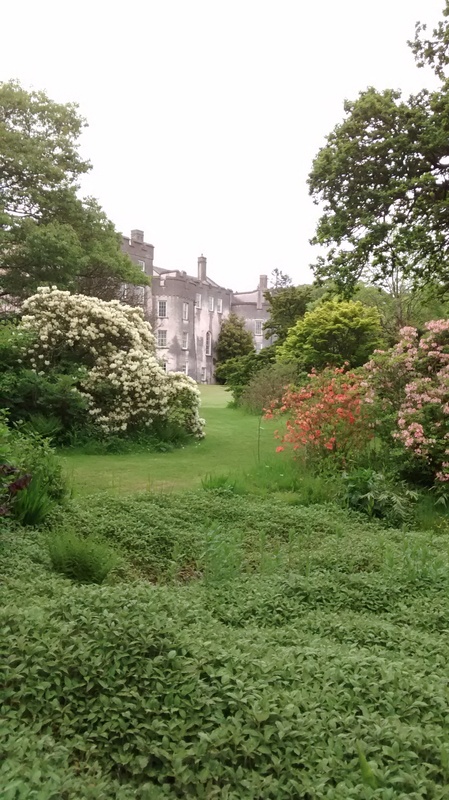 The topic is “The Woodland Garden and its Plants” and the talk will be presented by Roddy Milne, head gardener at Picton Castle. Some of you may already have visited Picton Castle, but do come along as enjoying an hour with Roddy as he gives us tips and advice is not to be missed. If you are planting up a wooded area yourself then you’re sure to get some hints on how to proceed. 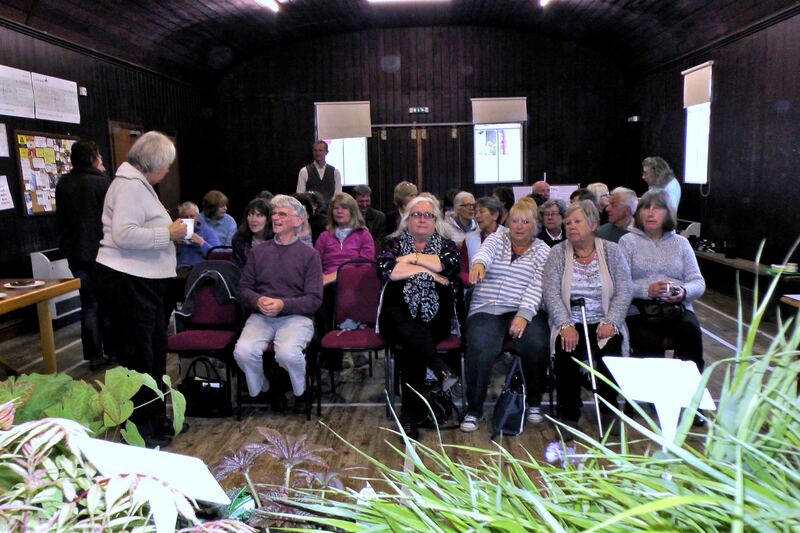 There will be time to ask questions and a plant sale, plants brought along by Roddy and of course those grown by our members. If you would like to know more about Picton Castle, near Haverfordwest, and perhaps plan a visit this spring, have a look at www.pictoncastle.co.uk for more information. This 40 acre site is at its best at this time of year, especially the woodland walks and spectacular display of rhododendrons. This is taking place on Wednesday May 10th. If you haven’t already given your name to Julian please do so asap. We need to know numbers to organise car sharing to Donna’s. The plan is to meet in the car park at Cymdu pub at 11.50 am and sort out filling the 4 cars Donna can accommodate from there/organise a shuttle service if needed. After Donna we go on to Elena for lunch – remember to bring a sharing plate of food; and then on to Tina’s for about 2.30 ish. Anyone interested who hasn’t done so already and would like to car share, please let Julian know. The date for this is 24th May. The aim is to meet at Westonbury Mill in the morning, when it opens at 11.00 am and go on to Hergest Croft for the afternoon. Lunch can be had at either. Details will be finalised at the May meeting.